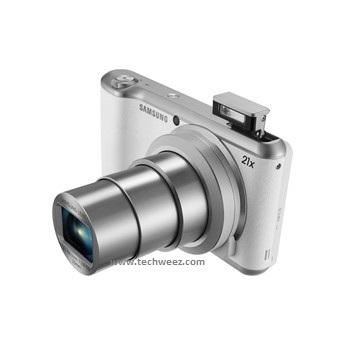 Samsung just launched the followup of the Galaxy Camera and named it the Galaxy Camera 2. Galaxy Camera was a breakthrough for Samsung as they added an Android Operating system to a full camera with physical zoom making it the most connected device as of early 2013. That made Samsung the award winner of GSMA most connected device of 2013 alongside the best mobile imaging device award a bit later at Tipa. Galaxy Camera 2 comes with white and black colour options with the black one bearing a textured feel that gives it a slight retro design. No mention of 3G/4G capabilities on this one like there was on the Galaxy Camera. NFC capabilities on this camera come with an app named Tag & Go for photo sharing to NFC enabled devices. You can also control the Galaxy Camera 2 remotely using a smartphone with the remote view finder. It also comes with other features for image capturing like Creative Capture that has 28 image presets with Smart Mode for the less technical user. Samsung has also put in some work on the selfie phenomena and added Selfie Alarm which takes 5 consecutive high res photos for users to select what came out best. Multi Motion Video on the other hand allows users to set video speed. Samsung will be demoing the Galaxy Camera 2 alongside new devices of 2014, mostly in the consumer electronics category at Consumer Electronic Show in Las Vegas within dates 7th to 10th January.